Abstract: Objective To explore the imaging features and diagnostic value of 18F-FDG PET/CT in pulmonary lymphangitic carcinomatosis(PLC). Methods Retrospective analysis on 53 PLC cases was performed. 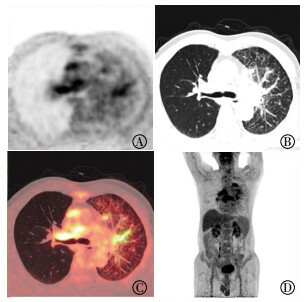 The patients underwent PET/CT+ thin breath hold CT scanning. The PET images were attenuated by CT scanning data and reconstructed by TrueX+time of flight method. The mean standardized uptake value(SUVmean) of each region of interest was measured, and the standardized uptake ratios(SUR) value was calculated. The difference of the SUVmean and SUR values in different regions was compared. Results Among the 53 patients with PLC, 51(96%, 51/53) displayed interlobular septal thickening of the interlobular septa with radioactive uptake, and the lung SUVmean was significantly higher than that of the normal lung field(1.46±0.92 vs. 0.58±0.18, t=19.85, P < 0.01). The interlobular septal thickening lung/mediastinal blood pool SUR was higher than that of the normal septal lung/mediastinal blood pool SUR(0.84±0.38 vs. 0.40±0.21, t=12.77, P < 0.01), and 51 cases(96%, 51/53) manifested bronchovascular bundle uptake enhancement. The SUVmean of PLC involving bronchovascular bundle was significantly higher than that of normal bronchovascular bundle(3.85±1.67 vs. 0.90±0.19, t=15.45, P < 0.01). The SUR of the thickened bronchi vascular bundle/mediastinal blood pool was higher than that of the normal bronchovascular bundle/mediastinal blood pool SUR(2.89±0.94 vs. 0.59±0.19, t=12.62, P < 0.01). In 51 cases(96%, 51/53), the swelling of the hilum and mediastinal lymph nodes was enhanced with radioactivity. 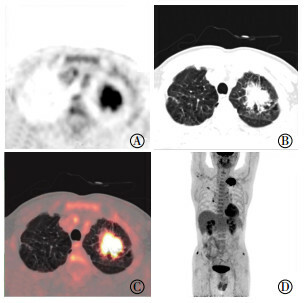 Conclusions PET/CT fusion imaging of typical patients with PLC is characterized by the thickening of bronchial vascular bundles with radioactive concentration and thickening of the interlobular septal nodules with increased uptake of radioactivity. Moreover, the hilar and mediastinal lymph nodes were enlarged or normal with abnormal concentration of radioactivity. PET/CT fusion imaging combined with local SUVmean and SUR can measurements not only enables the early and accurate diagnosis of PLC lesions. Moubax K, Wuyts W, Vandecaveye V, et al. 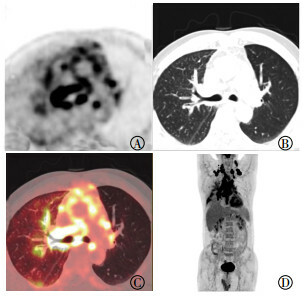 Pulmonary lymphangitic carcinomatosis as a primary manifestation of gastric carcinoma in a young adult: a case report and review of the literature[J/OL]. BMC Res Notes, 2012, 5: 638[2018-01-01]. https: //www. ncbi. nlm. nih. gov/pmc/articles/PMC3519516. DOI: 10.1186/1756-0500-5-638. 肖燕, 王海燕, 王宏伟, 等. 肺淋巴管癌病误诊病例回顾性分析[J]. 中国肺癌杂志, 2007, 10(1): 54–57. Xiao Y, Wang HY, Wang HW, et al. Misdiagnosis analysis of pulmonary lymphomatosis carcinomatous[J]. Chin J Lung Cancer, 2007, 10(1): 54–57. Ooi H, Chen CY, Hsiao YC, et al. Fluorodeoxyglucose Uptake in Advanced Non-small Cell Lung Cancer With and Without Pulmonary Lymphangitic Carcinomatosis[J]. Anticancer Res, 2016, 36(8): 4313–4320.